As the film opened, General Grievous of the Separatist Droid Army had infiltrated the Republic's planet of Coruscant and kidnapped Supreme Chancellor Palpatine (Ian McDiarmid). 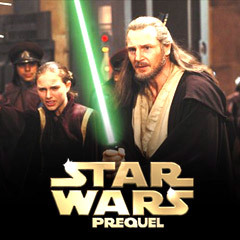 A major space battle was in progress: the Republic's forces of Jedi Knight Obi-Wan Kenobi (Ewan McGregor), a General, accompanied by his former apprentice (Padawan), now Jedi Knight Anakin Skywalker (Hayden Christensen), were fighting against the Separatist Droid Army and its flagship Armada, led by cyborg military commander General Grievous (Matthew Wood). Their challenging mission was to rescue the kidnapped Supreme Chancellor held on the command ship (The Invisible Hand) as it was escaping from. Buzz droids scampered over the wings of both of their starship fighters, threatening to destroy their controls. Kenobi's interceptor was damaged and his astro-mech R4-P17 was destroyed. Anakin's efforts to blast the buzz droids off his partner's wings failed, although he was able to maneuver one wing to knock most of the droids off. One of them crossed over to Anakin's fighter, where R2-D2 disabled it by hitting its center eye. After Anakin knocked out the shield generator, their two ships crash-landed in the command ship's docking hangar bay, where they emerged with lightsabers to take on a group of Battle droid foes. The two decided to "spring the trap" that they knew awaited them, then counter-attacked Destroyer droids and more Battle droids on their way to General Grievous' quarters. R2-D2 helped them navigate in an elevator, while he simultaneously incinerated two Battle droids in the hangar. As the two Jedi were about to rescue captive Chancellor Palpatine, Count Dooku confronted them and they commenced lightsaber dueling. Dooku used his Force powers to hurl Obi-Wan against a far railing and knocked him unconscious (and then dropped a platform onto him). As he alone faced Anakin (who claimed he had doubled his powers), Dooku taunted him: "Good. Twice the pride, double the fall." He also realized a change in Anakin: "I sense great fear in you, Skywalker. You have hate. You have anger. But you don't use them." Incensed by Dooku's words, Anakin connected with his "dark side" and severed the Count's hands. From the side, Palpatine urged: "Kill him now...Do it" - to which Anakin answered as a Jedi: "I shouldn't" - but went ahead anyway and decapitated the unarmed and defenseless Dooku. Palpatine congratulated him on his well-fought victory. As Anakin attempted to depart the ship with the rescued Palpatine and an unconscious Obi-Wan on his back, the Star Destroyer Guarlara blasted and attacked General Grievous' command ship The Invisible Hand. Explosions rocked the ship, and it began to wildly careen in space, and uncontrollably drop in orbit toward Coruscant. Grievous was able to have his bridge crew stabilize and level out the ship by firing the emergency booster engines, and then captured his three opponents in a ray shield trap. They were apprehended by Battle droids and brought to Grievous' bridge as prisoners, where the General quipped: "That wasn't much of a rescue." R2-D2's maneuverings soon allowed them to retrieve their lightsabers and duel against Grievous' tall IG-100 MagnaGuards and other droids. With the two Jedi surrounding him, the clever General used a guard's electro-staff to smash a window. Drawn out into space, he latched himself onto the hull of the ship with a tow cable, entered one of the ship's escape pods, devilishly launched all the other escape pods as decoys, and then 'abandoned ship' by heading in his pod to the Trade Federation's battleship. Anakin piloted the falling, burning and disintegrating flagship and was forced to crash-land it on Coruscant. It made a hard, emergency landing on one of the planet's industrial landing platforms, with coordinated directions provided by emergency fire-ships taking the vessel in. Obi-Wan sighed: "Another happy landing." Anakin received all the praise from Coruscant's politicians in the Republic's executive greeting area for his heroics in saving Obi-Wan from Buzz Droids, killing Count Dooku, and rescuing the Supreme Chancellor. Palpatine was certain that the Senate would vote to continue the war as long as escaped General Grievous was alive. Anakin shared private time with his secret wife Padmé Amidala (Natalie Portman), who spoke about "something wonderful" - she was pregnant. She asked: "What are we gonna do?" but he reassured her, told her not to worry, and said it was "the happiest moment" of his life. Later, she had decided to have the baby back on Naboo, in the Lake Country, where they would be safe. Anakin suffered from troubling nightmares of a groaning and pained Padmé dying during childbirth, something that he had earlier experienced just before his mother died. After awakening in a cold sweat, he vowed to her: "I won't let this one become real." [Their baby would definitely change their lives - she would have to step down from the Senate, and he would be expelled from the Jedi Council.] He again assured her: "Our baby is a blessing." "Careful you must be when sensing the future, Anakin. The fear of loss is a path to the dark side...Death is a natural part of life. Rejoice for those around you who transform into the Force. Mourn them, do not. Miss them, do not. Attachment leads to jealousy. The shadow of greed that is...Train yourself to let go of everything you fear to lose." Meanwhile, General Grievous had fled to the outer rim systems, to Utapau, where he immediately was in contact with Darth Sidious (via hologram). The General was instructed to move the entire Separatist Council of Trade Federation leaders (who were in hiding) to Mustafar, a volcanic planet. Sidious added: "The end of the war is near, General." He believed that Dooku's death was "a necessary loss," and then promised that Dooku would soon be replaced with a new apprentice - "one far younger and more powerful." When informed after the fact, Yoda called Anakin's appointment "disturbing" although it was begrudgingly accepted. Mace Windu (Samuel L. Jackson) told Anakin he was a High Council member, but was denied the rank of Master. Anakin called the unusual and insulting decision "outrageous" and "unfair." When Anakin was seated and calmed down, the Council discussed other more critical issues facing them. It was decided that Yoda would take a battalion of clones to reinforce the Wookiees on the planet of Kashyyyk. There, Yoda helped lead the Wookiees' defense in the Battle of Kashyyyk, accompanied by Chewbacca (Peter Mayhew) and other commanders, to battle various droids, gunships, and tanks. "The fact of the matter is you are too close to the Chancellor. The Council doesn't like it when he interferes in Jedi affairs....Your friendship with Chancellor Palpatine seems to have paid off....The only reason the Council has approved your appointment is because the Chancellor trusts you...The Council wants you to report on all the Chancellor's dealings. They want to know what he's up to." Anakin was conflicted and confused by his frustrating assignment. It would mean 'treasonous' spying against the Republic, against his long-time mentor and friend, and it was "something against the Jedi code." Later, Obi-Wan expressed his viewpoint to Windu Mace and Yoda about Anakin's assignment and the prophesy: "Is he not to destroy the Sith and bring balance to the Force?" Yoda felt the prophesy could have been "misread." Anakin shared his issues with Padmé who was also concerned about the continuing war: "What if the democracy we thought we were serving no longer exists and the Republic has become the very evil we've been fighting to destroy?" She wished for a more idyllic time with "no politics, no plotting, no war." In the Coruscant Opera House in Palpatine's private viewing box during a performance, Anakin spoke with the Supreme Chancellor, who shared intelligence information that General Grievous had been located and was hiding in the Utapau system. Palpatine also expressed his worry about the "collective wisdom" of the Jedi Council, although stressed his confidence in Anakin as the "best choice" to work with him. Palpatine sowed seeds of mistrust in Anakin by telling him that the Jedi Council wanted to control the Republic ("They're planning to betray me"). Anakin agreed that the Jedi didn't trust him - to which Palpatine added the Senate, the Republic, and democracy itself. Palpatine rightly deduced that Anakin's mission was to spy on him, and reminded him of his early teaching: "All who gain power are afraid to lose it. Even the Jedi." Palpatine argued that the Jedi and the Sith were similar in most ways, including the fact that both quested for greater power. Anakin compared the two groups: the Sith relied on their passion for strength ("They think inwards - only about themselves") while the Jedi were selfless ("They only care about others"). Palpatine digressed, speaking about the Sith legend of the tragic figure of Darth Plagueis the Wise, who was a powerful and wise Dark Lord of the Sith. He used his dark side powers to do good - to save people from death. His fate was that he feared losing his own power, which eventually happened. His apprentice was Darth Sidious (Palpatine himself), who killed his Master in his sleep ("It's ironic. He could save others from death but not himself"). Anakin asked: "Is it possible to learn this power?" Palpatine slyly answered: "Not from a Jedi." Anakin reported back to the Jedi Council, conveying the Chancellor's request for Anakin to lead the campaign to capture General Grievous at Utapau. The Council declined, citing instead that they would decide the matter - they proposed a Master with more experience, and Obi-Wan was selected. As Obi-Wan departed for Utapau, he expressed his pride and confidence in Anakin's strength and wisdom: "I have taught you everything I know. And you have become a far greater Jedi than I could ever hope to be." He also cautioned him to be patient with the Jedi Council: "It will not be long before the Council makes you a Jedi master." As they bid farewell to each other, both said: "May the Force be with you." Anakin remained stressed, but felt he might have found a way to save Padmé from his greatest fear - dying during childbirth - by learning the Dark Side power from Palpatine. Obi-Wan began searching for General Grievous in Utapau's Pau City, where he located him on the Tenth level, supported by thousands of battle droids. The Jedi Master arrived saddled on the back of Boga, a native dragon-like, beak-faced beast known as a varactyl, to engage in one-on-one combat with Grievous. When the General produced four lightsabers (one in each of his four hands), taken from Jedi he had killed, Obi-Wan sliced off Grievous' two lower hands, as Commander Cody-2224 (Temuera Morrison) assaulted the area with his army of the Republic, and Grievous fled on a wheel bike with Obi-Wan in pursuit on Boga. When thrown from the wheel bike, Obi-Wan stabbed the downed Grievous in the stomach with an electrostaff, tore open his protective abdominal plates, and fired at his internal organs with the General's own blaster - until he burst into flames and fell down dead. Back at Coruscant, Anakin reported the successful action against General Grievous to Chancellor Palpatine, and again expressed his doubts about ever becoming a Jedi Master, and his feelings of exclusion from the Council. Palpatine encouraged the brooding Anakin by offering his knowledge of the Dark Side of the Force, and arguing for a broader and more inclusive view than the Jedi. Palpatine offered a tempting way to save Anakin's wife "from certain death" and avoid being a "pawn" of the Jedi Council. Anakin then realized that Palpatine was the Dark Lord Darth Sidious and angrily drew his lightsaber, but instead of taking decisive action by killing him, he decided to turn him over to the Council. Meanwhile, the Jedi Council worried that 'Dark Side' powers surrounded the tyrannical Chancellor with his emergency powers. They believed that he should step down and return his powers back to the Senate, now that General Grievous was destroyed, or otherwise he should be removed from office. The Jedi felt that they would have to control the Senate to ensure a "peaceful transition." When Anakin reported to Mace Windu, he warned that the Chancellor wouldn't give up his treacherous power. The "terrible truth" was that Chancellor Palpatine was a Sith Lord, who was trained to use the Dark Side. Mace responded that the Jedi Order must move quickly to survive - Anakin warned that the powerful Chancellor's arrest would require his help, but Mace ordered him to stay out of the affair because he sensed "confusion" and fear that clouded his judgment. He must wait in the Jedi Council Chambers, while Mace and three other Jedi Masters would confront Palpatine in his office. As he waited and thought about the state of affairs, Anakin replayed Palpatine's voice and promises in his mind - if the Jedi destroyed the Chancellor, any chance of saving his beloved Padmé during childbirth would be lost. Disobeying orders, he rushed to a starship to join the Jedi Masters as they confronted Chancellor Palpatine in his office and arrested him in the name of the Senate ("The Senate will decide your fate"). The Dark Lord Sidious questioned the treasonous arrest, claimed: "I am the Senate," defensively drew his lightsaber, and quickly killed three of the Jedi, leaving only Mace Windu alive. As the duel continued (and Anakin arrived), Mace Windu disarmed Palpatine and threatened him. Seeming to be oppressed, Palpatine claimed to Anakin that the Jedi were unlawfully and traitorously taking over. Sidious then fired a flurry of Force lightning at Mace, who deflected it with the blade of his lightsaber. The streaks backfired into Sidious' body and caused his face to become distorted, deformed and disfigured. Seeing the weakened Sith, Anakin argued that he must stand trial rather than die, but Mace disagreed and was about to strike a fatal executionary blow for the Jedi Order ("He's too dangerous to be left alive"). Anakin intervened and chose to save Palpatine ("It's not the Jedi way. He must live. I need him") - he severed Mace's raised right hand. Now lacking support, shocked, and injured, Mace was blasted out of the window to his death by cackling Sidious' Force lightning, as he screamed: "Unlimited power!" Dark Lord Darth Sidious then appointed the horrified Anakin as his new apprentice ("Learn to use the dark side of the Force"), and re-named him Darth Vader. Anakin promised he would pledge his allegiance to the Chancellor and the Republic (and not to the Jedi), in return for saving his wife from death: "I will do whatever you ask. Just help me save Padmé's life. I can't live without her." Vader's first assignment was to launch a Clone trooper assault against the Republic's enemies - now the Jedi, by invading the Jedi Temple to crush the rebellion, and to mercilessly and brutally slaughter all of the Jedi found there (including swordsmasters and Younglings). Vader was then to travel to Mustafar to kill all of the remaining Separatist leaders including Viceroy Gunray (Silas Carson). Once the Sith ruled the galaxy, Sidious promised there would be peace and an end to war, although he was fomenting a major Galactic Civil War within the Empire. Later, from his office, Sidious (via hologram) also broadcast an order to Commander Cody of the Republic's Clone Troopers and to other commanders: "Execute order 66" - the action meant that Clone Troopers everywhere in the galaxy were to kill their Jedi Masters and Generals - the start of a Great Jedi Purge. On Kashyyyk, Yoda sensed widespread death, knew that there was an unexpected ambush happening, and beheaded two Clone commanders about to kill him. The only surviving Jedi to evade extermination were Obi-Wan, Senator Bail Organa (Jimmy Smits), and Yoda. When they reassembled, they feared that returning to Coruscant's Jedi Temple might be a trap, but when they arrived they were quickly able to subdue the Clone troopers holding it. They were overwhelmed, however, with the evidence of the carnage and brutal murder of Younglings by lightsaber blows. To keep other surviving Jedi away, they readjusted the Temple's signal. On the volcanic planet of Mustafar, Darth Vader fulfilled his mission to slaughter members of the Separatist Council and their Battle droids. Viceroy Gunray was the last to be executed by Vader himself - who began to physically manifest the Dark Side in his body - his eyes turned yellowish and red. After reporting his success, Vader received more instruction from Sidious - a message to all of the ships of the Trade Federation to shut down their droid units. Meanwhile, the scarred and deformed Palpatine (wearing a hood) convened a special session of the Senate, held in the Grand Convocation Chamber, where he announced that the rebellious plot of the Jedi to overthrow the Senate had been foiled. He told the assembled Senators that the remaining Jedi would be hunted down and defeated - followed by approving applause. In addition, to insure the security and stability of the Republic, he called for reorganizing it into the first Galactic Empire "for a safe and secure society" - thus making himself Emperor. In the audience, Senator Padmé remarked to Senator Bail Organa: "So this is how liberty dies. With thunderous applause." After Obi-Wan and Yoda viewed the security recordings of the Jedi Temple control center, and discovered how Anakin had become Lord Sidious' treacherous apprentice Vader, Yoda declared: "Destroy the Sith we must." Although Obi-Wan initially refused to kill Anakin and would rather kill the Emperor, Yoda insisted that he had to fight his ex-apprentice young Skywalker, who had become "twisted by the Dark Side." In her apartment, Obi-Wan informed Padmé of Anakin's evil transformation as the new apprentice of the Chancellor/Lord Sidious. Although anguished and disbelieving of the news, the very pregnant Padmé would not reveal Anakin's whereabouts, fearing that he would be killed. Obi-Wan hinted that he knew they were married, and expressed his regrets. As she departed (with C-3PO) on her starship bound for Mustafar to find Anakin, Obi-Wan snuck on-board. At Mustafar, Padmé relayed Obi-Wan's conversation with her, but (without denying anything) Anakin/Vader claimed Obi-Wan was trying to turn everyone against him. With his new powers, Vader thought he could protect her, but refused running away with her to leave everything behind, find peace and raise their unborn child. He thought he had brought peace to the Republic, and could now overthrow the Chancellor so they could rule the galaxy together. She was horrified when she saw his 'dark side' change, and confessed: "I don't know you anymore...You're going down a path I can't follow." When Obi-Wan walked down from the starship, Vader believed she had lied to him and betrayed him to Obi-Wan so that his former master could kill him. He began Force-choking Padmé until she fell unconscious. Obi-Wan accused his former apprentice of bringing his problems upon himself by his lustful greed for power (he had been "The Chosen One" but had joined the Sith rather than destroying them), but Anakin/Vader refused to stand aside and back down. Both drew their lightsabers for a climactic dueling struggle, representing the forces of the Empire's Dark Side against the democratic Republic - representing Peace, Justice, and Freedom. A wild lightsaber strike of the Separatist computer console controls opened the bunker shields, and they continued to fight perilously near the hot lava flows of Mustafar. During the fighting, Obi-Wan appealed one last time to his former apprentice, but when Anakin/Vader revealed he was not willing to view things differently, Obi-Wan yelled: "Well, then you are lost!" On the "high ground" of a safe black sand bank, Obi-Wan gained the advantage, but Anakin/Vader thought not: "You underestimate my power!" However, as Anakin/Vader jumped to the sand bank, Obi-Wan - with a quick maneuver - severed his left arm and both of his legs at the knees. After being disarmed and crippled, the helpless, pained, and raging Vader cursed at his former friend and Master. The river of lava near him caught his leg on fire, and he began to burn. Not wanting to watch the death or cold-bloodedly kill him, Obi-Wan took Anakin's/Vader's lightsaber, and departed on the starship with the injured Padmé and C-3PO. At the same time within the Chancellor's office in the Senate building, Master Yoda confronted dark-hooded Darth Sidious. The dueling powers of the two Force Masters led them into the Senate's Convocation Chamber, where intense fighting exhausted both of them and led to a stalemate. With aid from Senator Bail Organa, cloakless Yoda was able to escape and flee from the Senate, possibly to go into exile - to the isolated asteroid of Polis Massa. Darth Sidious flew to Mustafar, where Vader was found still alive. His charred, severely truncated body was resuscitated and brought back from death. On a medical ship at Polis Massa, Padmé (although healthy) quickly deteriorated, due to a broken will and heart - an emergency operation saved her twin babies (a boy named Luke and a girl named Leia), but her life was lost. Her final words to Obi-Wan expressed her strong-held belief that Anakin still had good in him: "There's good in him. I know. I know there's still - " A screaming and agonized Darth Vader was also being treated (without anesthesia) back in Coruscant. He was encased in a black armored life-support suit and helmet (or face mask), and fitted with new cybernetic (prosthetic) limbs and a mechanized respirator. After the reconstructed Vader was told by the lying Darth Sidious that he had angrily killed his own wife, he released a tormented scream of "Nooo!" - and his involuntary Force powers shattered nearby droids and other equipment. In Naboo, it was decided that the two children should be kept safe from harm by splitting them up. Yoda promised training for Obi-Wan in the meantime, to teach him about "the path of immortality" - from one (the spirit of Qui-Gon Jinn) who had returned from the netherworld of the Force. Yoda went into self-imposed exile on Dagobah. Everyone would watch and wait until the Skywalkers grew up and could challenge the reigning Empire. The two droids R2-D2 and C-3PO would be cared for by one of the Captains, and C-3PO's memory would be wiped. Padmé's solemn funeral ceremony was held in Theed. Her body was made to appear pregnant, to fake the baby's deaths and protect them. On a large Star Destroyer vessel, Darth Vader and Darth Sidious observed the construction of the Death Star, a moon-sized battle station. Senator Organa and his wife Queen Breha adopted Leia on Alderaan. Obi-Wan delivered Luke for adoption to his father's step-family, Uncle Owen and Aunt Beru Lars on Tatooine (with twin suns). The Master Jedi would remain close by in exile in the Jundland Wastes. With some of the same characters from the previous films, although in a different time period. It was the sixth and final film in the entire saga - and the third prequel in the series in terms of chronology. It was generally considered the strongest of the three prequel films. It was released on the 28th anniversary of the release of Star Wars: Episode IV: A New Hope (1977). The first of the films to receive a PG-13 rating. With only one Academy Award nomination (with no wins): Best Makeup. The film won its sole Razzie nomination - Worst Supporting Actor (Hayden Christensen). With a production budget of $113 million, and box-office gross receipts of $380.3 million (domestic) and almost $849 million (worldwide). It was the # 1 highest-grossing (domestic) film of 2005, besting second-place The Chronicles of Narnia: The Lion, The Witch, and the Wardrobe (2005) at $291.7 million. It was the # 2 highest-grossing (worldwide) film of 2005, just behind Harry Potter and the Goblet of Fire (2005) at almost $897 million. Regarding Episodes I-III, critics denounced the Jar Jar Binks digital character and the poor acting overall, but the films were universally praised for their digital film-making and special effects. Set-pieces: the opening space battle between General Grievous and the Federation against the Republic's Jedi during the rescue of Coruscant's kidnapped Supreme Chancellor Palpatine, Obi-Wan's one-on-one combat against General Grievous on Utapau, the duel to the death between Chancellor Palpatine (Darth Sidious) and Mace Windu, and the simultaneous, climactic lightsaber duels: on Mustafar between Obi-Wan and his former apprentice Anakin/Darth Vader, and in the Senate chambers between Yoda and Darth Sidious.